Mount Hood is the third in a series of posts on Cascadian Abroad focusing on the Seven Wonders of Oregon. Growing up in the northern end of Oregon’s Willamette Valley, it was easy to take the majesty of Mount Hood for granted. The glowing beacon in the east filled the horizon while effortlessly blending into the background. Looking at the northwest face of Mount Hood from the Hood River Bridge. It was only after moving away from the Valley that the iconic mountain became something more. When I’d drive home from college, it was the mountain that told me I was getting close. Living in Japan in the shadow of Mount Fuji, I would always be reminded of Mount Hood and how lucky I was to experience two of the world’s great natural creations on a regular basis. Mount Hood might be the quintessential Oregon image with its perfectly pointy, snow-covered peak. But in true Oregon fashion, the natural beauty is just the first of many layers that tell the whole story of the mountain the Multnomah tribe called Wy’east. At just over 11,000 feet, Oregon’s tallest mountain is also a semi-active volcano. Recent earthquake swarms, while common, served as a reminder that Hood is Oregon’s most likely candidate for a volcanic eruption, last bursting in 1865. The summit of Mount Hood is mostly free of snow by mid-spring. Eruption concerns don’t keep the visitors away. During the winter, Mount Hood is the ultimate playground for snow sports. 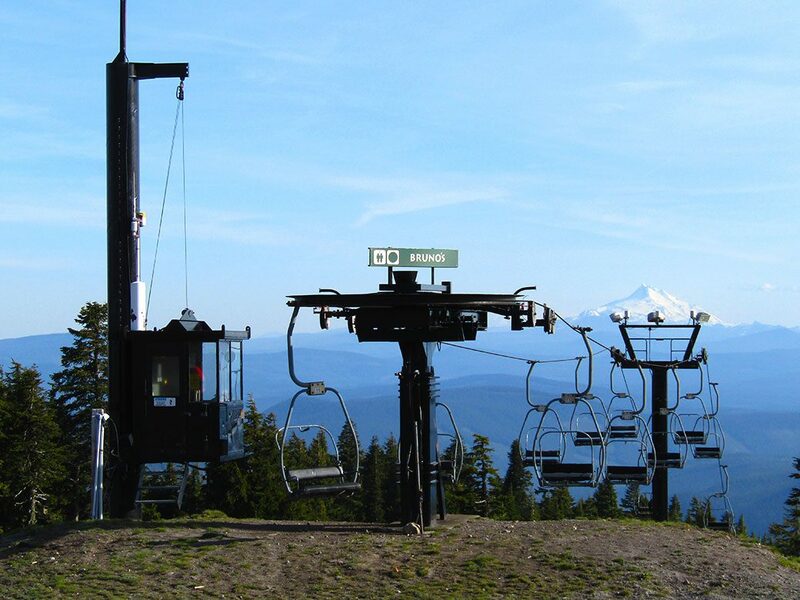 Snowboarders and skiers come from around the world to tackle the miles of trails at Mount Hood Meadows, Timberline and Skibowl, home to the largest night skiing area in the U.S. The surrounding national forest keeps things busy during the dry season, with more than 1,000 miles of hiking trails and 140 miles of mountain biking trails. We recently tackled a pair of gorgeous hikes, including the family-friendly Mirror Lake trail. The three-mile in-and-out hike slowly gains 700 feet of elevation via switchbacks from the trailhead to Mirror Lake. Views of Mount Hood’s peak reflecting in the aptly-named lake are simply breathtaking. In the afternoon, we tackled a good portion of the seven-mile Ramona Falls trail. Crowds thin out after the first mile where the trail crosses the Sandy River. The bridge over the river was destroyed in a rainstorm in 2014 and has not been replaced, requiring hikers to brave the crossing via fallen tree trunks. Around mile three, the trail connects with the famous Pacific Crest Trail, leading to the wide, cascading waterfall. Historic Timberline Lodge near the summit of Mount Hood. The “cave” protecting the stairs from the snow was still in place in June. The multi-floor fireplace in the Timberline Lodge lobby. The 90-foot chimney serves as the top of the iconic tower outside. 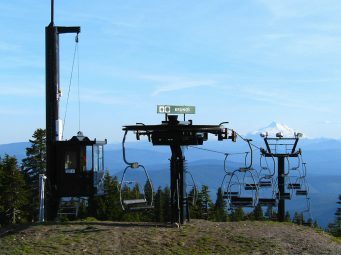 View of Mount Jefferson from Bruno Ski Lift on Mount Hood. 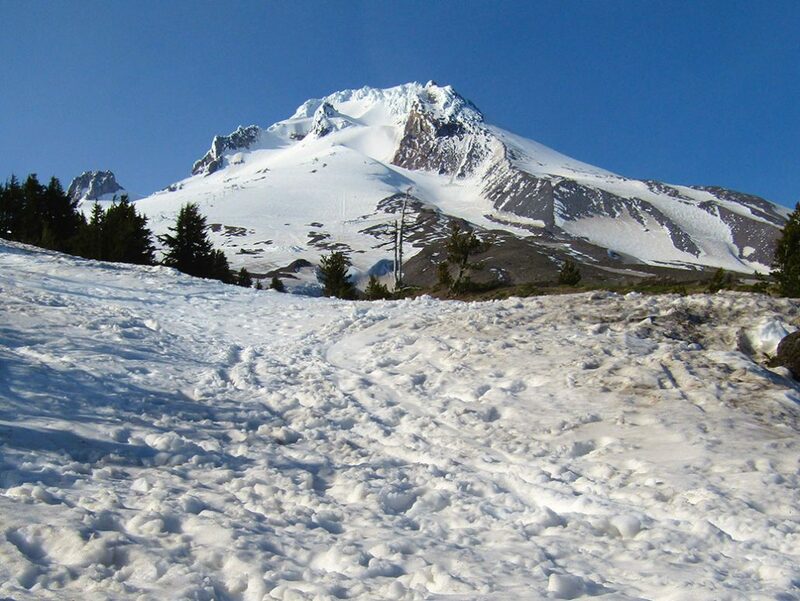 The snow-covered summit of Mount Hood begins to melt by early June. With all the physical activities, it’s no surprise that the area also offers plenty of opportunities for relaxation. Timberline Lodge is among the most popular stops for tourists visiting the mountain. The National Historic Landmark was originally a project of the Works Progress Administration as a way to put people back to work after the Great Depression. The 40,000 square-foot lodge was finished in 1938 and dedicated by President Franklin D. Roosevelt himself. 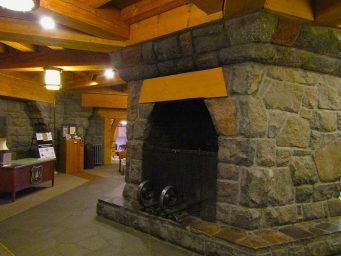 Today, the lodge draws in freezing skiers and snowboarders who surround the six-sided, two-story fireplace in the lobby. A small museum tells the story of the construction and restoration of the lodge and includes displays of Native American art, artisan-built furniture and even Roosevelt’s chair. As a child of the 1980s, I was most impressed to learn that the drawing of the skier on a chairlift on the orange Pee-Chee folder was taken from a photo on Timberline’s “Magic Mile” chairlift. The photo of Merrie Douna riding the world’s second chairlift was also featured in a 1948 issue of Life magazine. 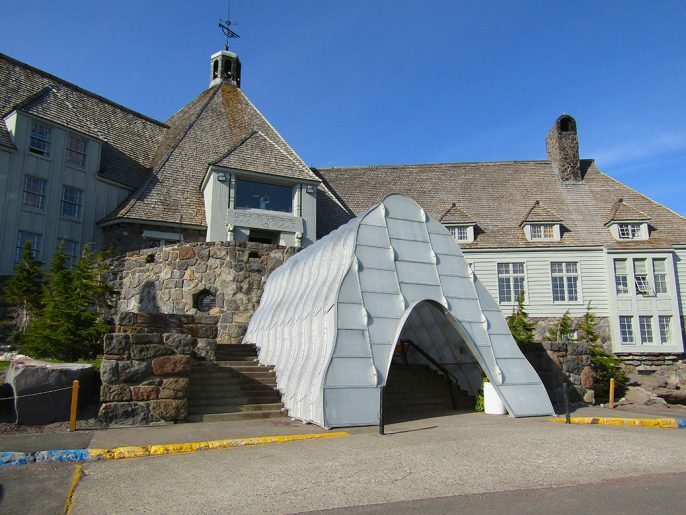 For out of town visitors, Timberline’s connection to popular culture is a major draw. The exterior of the lodge was featured in the 1980 Jack Nicholson classic The Shining as well as the film adaptation of Cheryl Strayed’s best-selling novel Wild. On a warm day, a stop into the Mt. Hood Brewing Co. taphouse just off of Highway 26 in Government Camp is worthwhile. Six flagship brews and a handful of seasonals are served on a frozen rail built into the bar, invoking the feeling of winter even in the dog days of summer. From Portland, take I-84 E to US-26 E toward Mt. Hood. From US-26, follow signs for Timberline Lodge. The lodge is open 24 hours. Check website for restaurant and lift hours. From US-26, follow signs for Skibowl. See website for seasonal hours. On US-26, look for the roadside parking area about two miles west of Government Camp. A Northwest Forest Pass is required, but day passes can be purchased from stores on US-26. Family-friendly. From US-26, turn left onto E Lolo Pass Rd near Welches. Turn right onto Forest Road 1825 and turn right across the bridge in about a half-mile. Follow narrow road to large parking area. A Northwest Forest Pass is required, but day passes can be purchased from stores on US-26. Due to the dangerous river crossing, this is not a family-friendly hike. On US-26 at Government Camp. Open daily 11 a.m.-9 p.m.